It’s always been preached among Search Engine experts that “Content Is King” when it comes to high ranking websites that the search engines love. The majority of these sites use a method which is known as Digital Curation. So if you’re wanting to draw attention, stand on your platform, wanting to lead the masses, sell or market your wares, heighten emotion, promote or emote, what you need to do is consistently post your best unique material to gather a following. There is a wrinkle however in this theory, which has been generally kept a trade secret within writing and content distribution circles which no one really talks about. All this while becoming one of the most powerful content development models on the Internet. What does that even mean you’re wondering. How do you cure the content. Well, since we as Internet citizens are constantly being bombarded and battered by information overload, what we’re looking for is quick concise accuracy in word. All this information comes flying on our windshields from a variety of media outlets including, television, radio, print and the Internet. What we can do however is control our options of choices that we’re faced with, and know which of these sources that we can trust to get this information. This is because we have no idea what’s been fabricated, or what’s the truth, critical or just an opinion when it comes to breaking news or trending information. There’s so much information overload now that’s directed our way, all at warp speed, that we’re now immune and conditioned to just reading the first few sentences or paragraphs of anything on the Internet to decide whether it’s worth the read, regardless if it’s factual or bunk. So to present accurate truth in content and to weed through all the mumble, and simultaneously attempt to stay focused, the single most valuable role which you as an author can do is deciphering the mass of information and then presenting and sharing what’s accurate. What you’re doing is locating and then reporting the best of the “cream of the crop” unbiased information for your audience to quickly absorb. This is the main reason why some of the most successful and oft read sites on the Internet, which are primarily blogs, draws in the most page views and reader traffic. These are the sites which successfully employs the curation content model. Lifehacker.com and Huffingtonpost.com are excellent examples of taking full advantage of the curation method. Mind you that more than likely, they also include a lot of their own unique content as well, such as actually writing trending stories, but the majority is curated material. What they’re essentially doing is rehashing, some say regurgitating the most recent in demand topics, the “need-to-know” information that everyone is searching for, which is often breaking news or technology hacks, and then present them translated in their own words on their blog sites. According to all the various sources who track the most page views on the Internet, some of these various curation sites are getting as much as 5 million visitors and 45 million pageviews every month. They’re doing this by just curating other sites and authors pre-written information, which can also include images and videos. Other sample curation sites who are using this exact model include: swiss-miss.com and neatorama.com. What these blog writers do is scour the Internet and come up with compelling headlines and engaging material. The titles of these posts become magnets to the Search Engine robots since they are highly searched for requests. Why you ask. well, because it does. All the information seekers and the blog writers will spent their time researching, reviewing, sourcing and then assembling the most sought after relevant content, so others, such as yourself won’t have to. So because these blogs are able to produce this consistent curated information, the millions of visitors come to trust their content and will also share it on the various social media networks, propelling the material to go viral. So, you’re wondering how you can provide this type of service to the Internet by delivering the coolest and the most hip content experience available, all by curation. Curation does appear easier than the tedious research and then pounding out those fresh unique articles on your word processor burning the midnight oil. 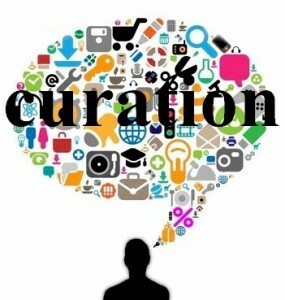 But before you begin to curate all of your content so it will reach Alexa’s Top 1000, while at the same time reaching fame and exploding your Adsense earnings, there’s something else that you need to know about providing digital curation. You can’t just repost something off the Internet via copy and paste. What you’ll still need to do is add some type of quality and value in your work, valid qualified opinions and relevance far beyond what the original content which you’re curating offers. It might involve just assembling and piecing together disparate pieces into one solid coherent article. Or, it can be rewritten in your own style and words, offering a complementary or an arbitrary opinion. It can also be your own “cliff-notes” outline, offering the highlights of a trending or relevant issue using quotes to attribute the original author. Your curated blog post can be your opinion or you can add additional value in content form. It’s strictly up to you how you decide to use this strategy to make it work the best for you.